Ajax pallet gate barriers have been designed for the ever-increasing demand in pallet movement. 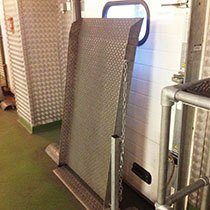 They provide the necessary all-round edge protection to prevent falls from height when loading and unloading goods. 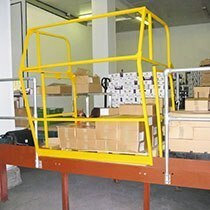 Ajax fixed folding step units have been designed to provide a safe working environment for operators who need to gain access to areas at various heights. 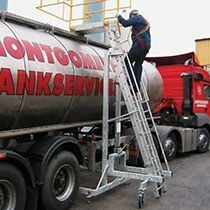 They are primarily used for assisting with the loading and maintenance of top-loading road tankers. 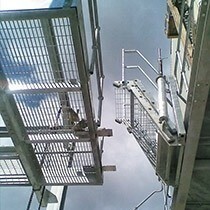 Ajax mobile and extendible step units have been designed to provide a safe working environment for workers who need to gain access to areas at various heights from the ground. Each step unit has been designed for areas where floor space is considered to be at a premium and a fixed unit is not suitable. 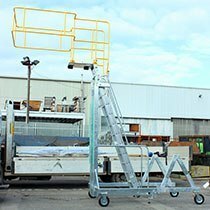 Ajax bridging access platforms are typically designed to bridge the gap between a loading bay and a vehicle load bed when loading and unloading goods. They have an aluminium non-slip tread plate decking for improved safety underfoot when walking across the surface in dry and wet conditions. 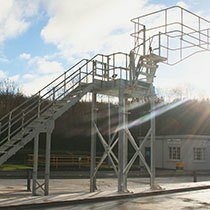 Whether you require a staircase to your fixed folding step unit or you require a staircase to a brand new platform, Ajax is able to provide the full service, eliminating the need for extra suppliers. 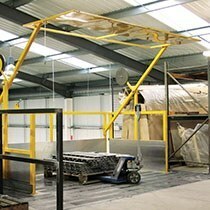 All staircases and platforms are custom made to your specification. Ajax can offer our in-house design and fabrication services for your bespoke safe access requirements. The standard range of products can be customised to suit your non-standard operations, or an entirely new bespoke access system can be made. Ajax Safe Access have over 50 years of experience in designing, manufacturing and installing high-level access and protection systems. 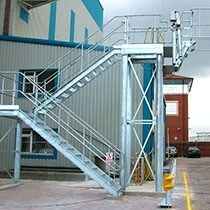 At Ajax we offer a range of safety access solutions for many industries and practical applications. We have developed an extensive range of products to provide a safe working environment, helping to eliminate the hazard of falls from height; a common cause of injury in the workplace. 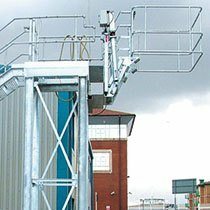 Most importantly, all of our safety access solutions have been designed to comply with Working at Height Regulations 2005 (WAHR) and manufactured to comply with BS EN ISO 14122. 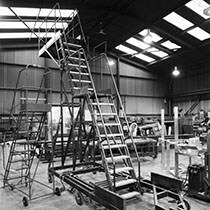 Our decades of experience and key technical expertise means we can provide the highest quality, reliable, easy to operate and durable safety equipment. We design and manufacture all of our safe access systems at our fabrication facility in Nottingham, using skilled engineers and quality materials to ensure a dependable final product. Our extensive accreditation portfolio also means we’re first in the industry for credibility and technical competency. 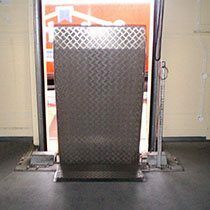 In addition to our standard range of products, Ajax Safe Access can also offer in-house design and fabrication services for your bespoke requirements. We can customise the existing range of Ajax Safe Access solutions to suit your non-standard operations, or we can design and manufacture a brand-new new bespoke system that suits your needs. Ajax understands the challenges you face and provides you with the experience and technical proficiency you need to deliver a custom made access solution. 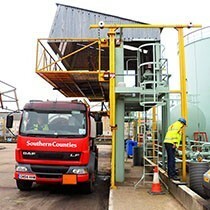 We aim to provide employers with results that allow employees to work both safely and efficiently. For more information about our standard or bespoke products, get in touch with us online or call us on 0115 986 6321. To discuss your next safe access system and receive expert advice, please contact the Ajax Technical Team; you’ll be glad you did!